Susan smiled at her grandfather as he stepped out of the newsagent’s shop with a newspaper under one arm and a pocket of his jacket bulging. She linked arms with him as they walked on through the busy East London streets. She still hadn’t quite made up her mind whether it was frightening or fascinating to see those red double Decker buses go by, sometimes singularly, sometimes two or three in a line with different destinations on the front. She had rarely visited the great Capitol on their homeworld, and she was very young then, but what she remembered was a much quieter kind of place. Busy, yes, but not so noisy. If the traffic frightened her, the people of London certainly fascinated her. Because they had become exiles, she never began developing her latent telepathy, but the minds of the humans around her were an exiting buzz in her head. She couldn’t exactly hear their thoughts, but she felt their emotions. Mostly, on this warm Saturday morning in August, they were happy emotions. People were enjoying the freedom of the weekend, shopping, meeting friends, planning their afternoon in the sunshine. Susan didn’t really have any friends. She looked at a group of young women not much older than she was, walking together, looking in the windows of the dress shops before heading for a café to sit drinking coffee. She felt a longing for that kind of relationship with girls of her own age. But she never quite worked out how to be a part of the ‘in-crowd’. She did her best to keep up with the music, the fashions, the gossip of her peers, but she didn’t quite manage to fit in, all the same. Spending time like this with her grandfather was a compensation of a sort. She loved him dearly, and cherished the good days when his mind wasn’t wandering too much and he wasn’t too tired. He wasn’t leaning so heavily on his stick as he walked, and the distance to the closest green space to their unlikely home didn’t seem so arduous as it might. Haggerston Park, maintained by the Borough of Islington, wasn’t an old park. Most of the lawns and flower beds and the paths between them were laid out a little over ten years before over the remains of a tile factory and several streets of houses destroyed in the Blitz. That was a sad reason for its existence, but Susan and her grandfather appreciated that space where a bit more sky was visible over their heads. A blue sky. She remembered the burnt orange sky of her homeworld. It was a much bigger sky than this. They lived on the southern plain where there was little to obstruct it in any direction. They had seen many other skies in the course of their travels, but this blue sky was satisfactory for now. They came to a pleasant spot with fragrant flower beds and lawns. The Doctor sat on a bench. Susan spread a rug on the grass and then slipped off the blouse and wrap around skirt she had worn in the street to reveal a pair of shorts over a bathing costume. Her grandfather looked at her outfit with a slight frown of disapproval, but there were young girls and women all over the park dressed the same way. The Doctor reached into his pocket and gave her a small white paper bag with lemon sherbet sweets in it while he opened another packet and filled a pipe with the fresh tobacco. The fragrance filled the air as Susan sucked a sweet and read a book lying on the towel. The Doctor read the newspaper. The headline and much of the first few pages was concerned with the daring train robbery that had taken place two nights ago. The Doctor read the details and tutted disapprovingly. This planet had so much to commend it. The people had the capacity for greatness. But so often they used that capacity for low, shabby deeds, instead. He felt a little disappointed in some sections of the Human race. He looked from his paper to his granddaughter. The book she was reading was very thick with closely printed text, but she was turning the pages rapidly. She paused and looked around at her grandfather. “I will be careful, Grandfather,” she promised. “You must not worry.” She closed her book and came to sit beside him. He smiled softly and put his arm around her shoulders. She felt safe that way. She always had. The Doctor smiled at his granddaughter and kissed her cheek gently. She went back to her sunbathing and her book after a while. The Doctor smoked another pipe and slowly fell asleep. Susan got up from her towel and gently took the pipe, emptied it and slipped it into his pocket. He was in no danger of setting himself alight and the snooze in the sunshine would do him good. She returned to her book and read it slowly, appreciating it fully as he said she should do. Even though she was the child of a Time Lord and aware of time passing in the very fibre of her body she managed to lose herself in the story and was surprised to find an hour and a half had passed by while she was engrossed in the story. “No, that shouldn’t be there!” The Doctor woke with a start and spoke suddenly. Susan sat up quickly and stared at him. He grabbed up the newspaper and began rifling through the pages. His soft brown eyes dilated rapidly as he read each column. He folded the paper and stabbed at it with his finger. Susan looked at the article he indicated. It was barely two paragraphs. It was about an artefact on display at the British Museum. That was enough to convince Susan that this wasn’t just a fanciful dream. The name of their home planet, Gallifrey, was never forgotten by either of them. But they rarely said it aloud. Her grandfather always spoke of ‘our world’ or ‘our home’ when he spoke of it. That he had uttered the name of Gallifrey in a public place, here on Earth, was proof that there was something in what he was saying. She put her skirt and blouse back on over her bathing costume and put the book and towel into the bag she brought them in. It was things like taking a train from Islington to the City of London that caused The Doctor problems. It wasn’t mere snobbery that kept him from using public transport. He really did have trouble working out how it all worked. It was Susan who sorted out the coins for tickets and checked the route on a map of the Underground, who made sure they were on the right platform and ensured that he didn’t trip getting on and off the trains or on the steep escalators. She was sure there must have been a time when he could manage such things. She knew he had lived in London when he was a young Time Lord, both earlier and later than the 1960s. He often pointed out places that he knew and talked of the changes in the city over the decades. He must have understood about the Underground once. But he was getting old, drawing close to his first regeneration, a traumatic event in the life of a Time Lord. It affected his mind and his body. What would have happened to him if he had gone off in the TARDIS on his own, leaving her with her mother’s family on Gallifrey? He would be dead by now, surely? He couldn’t manage for himself. And one day, that was going to be a problem - one day when she found somebody she wanted to spend her life with, when she wanted a home and a life of her own. Those things occupied her thoughts as she sat next to her Grandfather on the mainline train from Cambridge Heath to Liverpool Street, then the Piccadilly line to Holborn and back up into the London air again. She loved her grandfather. He was her closest living relative. She couldn’t imagine not being with him. And she knew he couldn’t possibly manage without her. Which meant she had to stay and care for him, for decades, perhaps, at least until his first regeneration. After that, he should have a younger body and a more settled mind, and he might not need her quite so desperately. Then, perhaps, she could think about her own future. It wasn’t an easy prospect. Especially living as she was now, as a Human girl of fifteen, going on sixteen. Girls of her age or a little older were finishing their education and getting jobs, meeting young men. They looked forward to living independently of their parents in a few years, not decades. He didn’t answer her. His mind had turned from the subject. He often did that. Anything could distract him. She knew he would come back to it again. Later today, tomorrow, or perhaps in the middle of next week, he would return to the question of her future as if they were still walking across the Gardens having the same conversation. But for now it was forgotten as he looked at the grand edifice of the British Museum. Susan couldn’t remember the Great Library, but she knew a lot of the buildings in the Capitol were of a similar architectural style to the ‘classical’ style of London’s most impressive buildings. Quite why Gallifrey, two hundred and fifty million light years away, should have similar architecture to Earth, she didn’t know. But she liked the fact that it did. It was a comforting, familiar thing about this planet so far from her home. The British Museum had a lot to offer the visitor, of course. It housed treasures from all over the world. Susan had been here once before on a school trip and had enjoyed what she saw on the afternoon tour. She would have enjoyed walking around it at her leisure without her chattering classmates as a distraction. But The Doctor was anxious to find the Duveen Gallery. He asked directions in a rather peremptory and impatient tone from one of the staff and headed directly there. The Duveen Gallery housed those famous Elgin Marbles, as well as other treasures from Greece. But, again, The Doctor was single-minded in his mission. He went directly to the glass case where the Mask of Agamemnon was displayed. He stared at it for a long time, then he put his hand directly over the gold mask, not quite touching the glass. Susan did as he said, but she couldn’t feel anything. She shook her head. Susan looked. And yes, she did recognise the letters on the vase. ?SFO?. They were in the first alphabet she ever learnt, sitting on her grandfather’s knee and reading from a book made of Gallifreyan parchment. But that didn’t prove anything, either, except perhaps why ‘classical’ architecture was common to these two worlds. “Even if that were true, Grandfather, I still don’t see how this could be it. I mean...” She looked at the curious gold mask with eyes that were at the same time wide open and with closed lids. It was a stylised face of an old man with a moustache and beard. If she ever imagined how the Creator of her Time Lord race looked, it would probably be an old man with a beard. But there was no clue in this mask to tell her this was the face of the greatest Time Lord of all. She couldn’t be sure. He reached out his hands again. This time he touched the glass directly above the mask. Then he screamed. Susan yelped with shock as she saw his face twisted in terror. He seemed unable to take his hands away from the glass. She pulled at his arm desperately as gallery visitors stared and a security guard approached warily. He let go and stopped screaming. Instead he was sobbing and gasping for breath and speaking random words, not in English, but High Gallifreyan. “Grandfather, come on,” Susan begged him, holding back her own tears of panic and fear. “Come on, let’s go outside.” The security guard was pushing past onlookers to reach them. She was desperate to get her grandfather out of the Duveen Room and out of the museum. “May I help?” asked a young man in a neatly pressed white shirt. He had a badge proclaiming him to be an assistant curator named Anthony Giles. “Come this way,” Mr Giles said. He guided them towards a door marked ‘Staff only’. It was quieter in the corridor beyond and there was a lift to the ground floor. Mr Giles made sure they got safely through the busy foyer and out to the wide paved apron in front of the grand building. There were benches there beside a lawn. Susan took her grandfather to sit down. He was a little calmer now, but still murmuring random words. “You’re not Jewish, are you?” Mr Giles asked. “I beg your pardon?” Susan was surprised by the question. Her hearts sank at the thought of taking him back to Shoreditch on the Underground, up and down all those escalators, surrounded by people, confusing him even more. Ordinarily, she would have refused the offer. But she didn’t have enough money in her purse for a taxi and she really felt desperate. She nodded and managed to say thank you. Mr Giles went out onto Great Russell Street and hailed a black cab. He helped Susan to get her grandfather safely into the back seat and gave the driver money for the fare. He watched the taxi turn into the traffic and then walked back into the British Museum again. As he was crossing the foyer his superior, Mr Ward, stopped him. “You’ll never amount to anything in this job if you don’t learn to pay attention,” Mr Ward told him coldly. Mr Giles didn’t reply. He couldn’t imagine why the senior curator wanted to know the address of two people who had simply visited the museum and had a distressing incident there. It wasn’t worth making a fuss about. He went on with his work and put the whole thing out of his mind. Mr Ward didn’t. He returned to the Duveen Room and stared at the Mask of Agamemnon for a long time. He had many other duties in the huge Museum with so many other galleries, but he stayed close to the collection of Greek artefacts throughout the rest of the afternoon. He watched the visitors to see if the old man and the girl should return, or if anyone else might take an unusual interest in the Mask. Susan had the taxi drop them outside the wooden gate with the words ‘I M Foreman, Scrap Merchant painted on it. She waited until it was gone before she pushed the gate open. Her grandfather leaned heavily on her until they reached the safety of the TARDIS. Inside the cool console room he gave a deep sigh and sat down on his favourite chair. She went to make him a cup of tea. By the time she returned, though, he had fallen asleep. She checked to make sure he WAS just asleep, then drank the tea herself. She sat quietly, lulled by the faint vibration that the TARDIS had even though it had been stationery here in the junk yard for over a year, now. She was startled when, a little more than an hour later, The Doctor woke from his nap and seemed completely lucid, even if he was still peculiarly obsessed with the artefact in the museum. The museum was closed, now. The cleaners and night watchmen were at their work. But none of them would challenge a senior curator who used his master key to open a display case. Ward lifted the mask from the velvet pad it rested on and placed it against his face. There were no fastenings of any sort, but as he placed the ancient gold next to his skin, he felt as if it had moulded itself to his own features and would remain there until he chose to remove it. He felt the mask as a second mind within his own brain, guiding him, strengthening his will, giving him some of its phenomenal power. Susan enjoyed the evening out. So did her grandfather in his own way. The tea at the ABC restaurant was pleasant. The film, Cleopatra, in technicolour, didn’t really impress him, but he took a vicarious pleasure in pointing out the historical inaccuracies in a loud whisper. Susan thought it amusing when the ushers came down the aisle trying to locate the person disrupting the film that way and his voice seemed to come from a different part of the cinema altogether. He chuckled mischievously at their confusion. Afterwards as they walked home, he told Susan his own story of a visit to the Roman era. Occasionally, when his mind was clear and he was in a good mood, he would do that. She loved to hear of his exploits as an adventurous young Time Lord with a TARDIS that worked much better than it did now and which could take him anywhere he wanted to go. “My master wants you,” he said in a curious monotone quite unlike his kind voice when he had helped them this afternoon. As he stepped fully out of the shadow into the pool of light from a street lamp, Susan saw his eyes, fixed and staring, gripped by an hypnotic compulsion. She started to scream, but a hand clamped over her mouth from behind. There was a damp cloth and a clinical smell that assailed her senses. As she struggled not to pass out, she saw Mr Giles do the same to her grandfather, despite him getting in several whacks with his stick. She felt herself bundled into the back of a car along with her grandfather. The drug hadn’t quite completely knocked her out. She was insensible enough not to be able to scream, or to struggle, but she was aware of the movement of the car. She was aware of the brightness of street lamps and traffic lights. Then the car stopped in a dark place, an alley, she thought as she was dragged out. She felt as if there was air above her. Then she was in a darker place. There was a torch reflecting off walls, a different kind of movement, smooth and slow, steep downward movement. Then they were in a small, enclosed space. She felt walls and floor and ceiling all nearby. There was a noise, a rushing, booming noise that came and went with a Doppler effect. The room vibrated. It was quiet. Their captor was gone. She forced herself to wake up fully. It was a struggle, but the fuzziness left her mind and she moved her limbs. She opened her eyes wide. The room was dark, but not pitch dark. There was a faint light coming under the ill-fitting door. It was enough for her Gallifreyan eyes to process. She could see that she was in some kind of old storeroom. She could smell the dust of neglect. She could also see her grandfather slumped on the hard floor, and somebody else, too - Mr Giles, the assistant curator, who had helped kidnap them. He was a prisoner, too. He was sitting with his back straight against the wall and his legs outstretched. His eyes were wide open but unseeing. “Grandfather,” she whispered urgently, shaking him gently but firmly. “Yes, yes. I’m awake, child. Don’t fuss,” he replied. And, indeed, he was wide awake at once. His eyes were wide. He struggled to his feet with her help. He didn’t have his walking stick. It must have been lost in the struggle. Susan looked around and found length of metal pole about the right size. He clung to it for a few moments as if he needed it to hold him up, then he grasped it in a different way and wielded it at Mr Giles. There was another loud noise and the light under the door increased briefly. It was long enough to clearly see the blank expression in the curator’s eyes. While he was speaking, he reached into his pocket and found his old fob watch. He held it by the chain and swung it gently back and forwards in front of the assistant curator’s face. Susan wasn’t at all surprised when it broke the trance and the young man shook his head and blinked rapidly. “What do you remember?” The Doctor asked with a surprisingly kind tone in his voice for somebody who had collaborated in their capture. “Don’t force it, just let your mind sort the memories out for themselves. That was all he could remember. But it was enough. Two questions were answered. Who did this, and why. Another loud noise and a light under the door disturbed them. Mr Giles looked around in surprise. The Doctor looked at the wooden door then carefully searched around the dusty old storeroom until he found a piece of wire. Mr Giles was surprised he was able to pick the lock with it. Susan wasn’t. She wasn’t sure WHY her grandfather knew how to do such a thing, but it was one of his many talents when his mind was clear. It seemed clear now, and his body was less frail than it so often was. The lock snicked satisfactorily. The Doctor opened the door cautiously and stepped out. Susan and Mr Giles followed. “We’re in the old station,” the curator noted. “What old station?” The Doctor asked. They were standing on a platform. The sign identifying the station was dusty but still readable. Around the walls were old time tables and an out of date underground map that still listed “British Museum” as one of the stops and an advert for Oxo. There was also a chocolate vending machine that actually still had some bars in it. Susan looked at it and decided she would have to be VERY hungry before she risked eating one of them. A train rumbled by. They all turned and looked at the brightly lit windows that flashed by. The people inside didn’t notice them standing there on the platform. When it was gone, they became aware of another source of light. They all turned towards the escalator. The ‘up’ stairway was switched off, but the ‘down’ was moving slowly and there was somebody riding it - Mr Ward, wearing the Mask of Rassilon. The mask was glowing like a small golden sun. “I will kill YOU,” Ward answered in a voice that had a strange resonance as if two voices, one Human, one not, spoke together. He lunged towards The Doctor. Susan screamed, but her Grandfather was not so helpless as he appeared. He moved agilely out of the way and turned to defend himself. Ward turned and raised his hand. Something like a ball of lightning flew from his hand, but The Doctor raised his own hand and the ball halted in mid air. The two men were using the force of their minds to push it away. There was an impasse for several minutes, then very slowly the ball began to push back towards Ward. He redoubled his effort and it edged back towards The Doctor. His face showed the strain of such intense concentration. His teeth were set together. His eyes were wide. The muscles in his cheeks twitched and sweat poured down from his brow. But he stood his ground. The fireball was once again heading towards Ward, and the longer it took, the harder it was for him to resist. Susan watched in silence. She felt Mr Giles grasping her shoulder, holding her back. The assistant curator didn’t know what was happening. He didn’t understand why a frail old man was able to stand up to such supernatural power as Mr Ward apparently had. But he knew this strange duel had to reach its conclusion one way or another. Susan understood it a little better. Yes, the presence of the Mask, made from gold ore mined from the rocks of Gallifrey was giving him strength and vigour he didn’t have ordinarily. It also lent to him the mental strength to fight the combined forces of Mr Ward and the Mask’s intelligence. And because he was a living, breathing Time Lord, not a Human or the trapped essence of a long dead Time Lord, even Rassilon himself, he was strongest. The lightning ball touched Ward’s hand. Then he screamed as it expanded and enveloped him. At the same time, The Doctor stepped forward and grabbed at the mask. He pulled at it and it came away partially. But Ward still had some strength left. Perhaps it was ordinary Human strength now. The Mask wasn’t glowing, and Ward’s voice, though hysterical and almost incoherent, was singular again. Then Susan DID scream, her voice echoing off the walls. Ward fell back. The Doctor fell forward, carried by his momentum. Both dropped from the platform to the line below, just as the rumbling sound heralded the approach of another train. Mr Giles held her even more tightly and stopped her running to the edge until the roar and the flickering light from the passing carriages was gone. When it was, she broke free of him. “Grandfather!” she cried out with relief. The Doctor was standing against the edge of the far platform, on the down line. The train had passed on the up line. He was holding the mask in his hand. Ward’s body was at his feet. He lifted him over his shoulder and ran across the lines. He passed the body up onto the platform before he let Mr Giles help him up. “Grandfather... what about you?” Susan asked. Mr Giles nodded and lifted the body. He led the way, not up the escalator to the disused station entrance, but through a door near the tunnel opening. Inside was a narrow passageway that they followed for some time. Then they came to a service lift with a gate that pulled back and a very functional interior. It ascended slowly, and for much longer than Susan expected. When she said so, Mr Giles nodded. They emerged in the administration section of the museum, where the public rarely went. It was relatively easy to get Mr Ward into his office as The Doctor suggested. 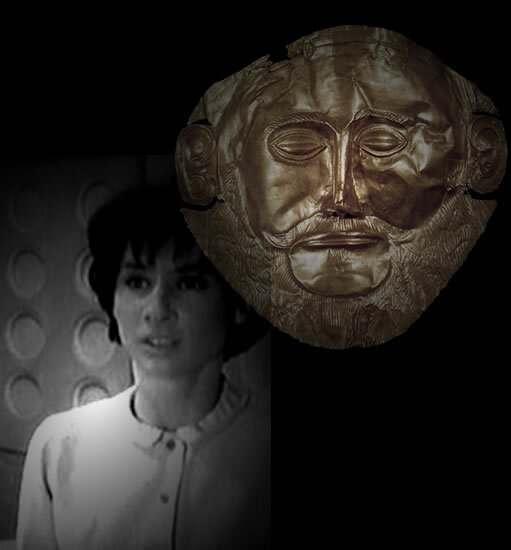 “What about the Mask of Rassilon?” Susan asked. The Doctor was still holding it carefully. 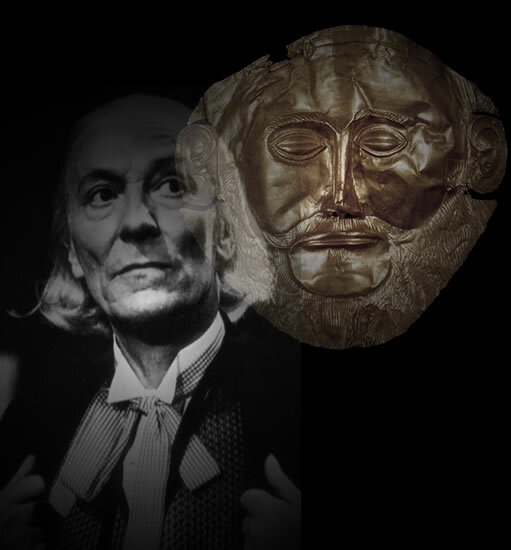 “You mean the Mask of Agamemnon?” Mr Giles questioned. “You are a wise man, sir,” Mr Giles said. They went to the Duveen Room. The Doctor laid the Mask of Rassilon back on the velvet pad and Mr Giles locked the cabinet. Then he walked with The Doctor and Susan to the taxi rank on Great Russell Square. He said goodbye to them and wished them well. Susan replied on behalf of her grandfather, wishing him the same. The Doctor was quiet on the journey home. Susan looked at him and knew the invigorating effects of the Mask were wearing off. Soon he would be frail and forgetful again, a worry and a burden to her, but one she carried gladly out of deep, unconditional love. He nodded slowly and smiled softly at her. That affirmation had taken the last of that borrowed strength. When he spoke again his voice was slower and vaguer, but his words weren’t. “Yes, Grandfather,” Susan replied dutifully.